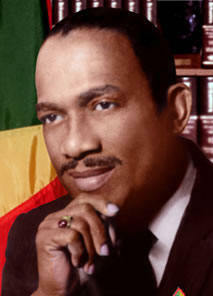 One may say that then Prime Minister, Eric Gairy, had himself to blame for the events which catapulted him out of office 36 years ago, on 13 March 1979. His own repressiveness and scant regard for very basic and fundamental rights which we all take for granted, but have always held dearly, would undoubtedly have helped trigger the violent overthrow of his government. Look at, for example, the use to which he put his self-created Defense Force (Green Beasts), the Secret Police and Mongoose Gang, his Night Ambush Squad and the Voluntary Intelligence Unit for the Protection of Private Property. Or, the unprovoked — sometimes brutal beatings — at times selective and random, of many persons; or, for that matter, the killing of others, including Jeremiah Richardson and Alister Strachan. Witness, too, the enacting of repressive bits of legislation, his intolerance for peaceful demonstrations which he often violently suppressed, the growing decline in peoples’ standard of living while he amassed more and more wealth, and the disillusionment with the electoral process as a legitimate avenue for expressing the will of the people. Coming against the mosaic background of the ushering of the New Jewel Movement, a group of resourceful, well-meaning, courageous young men who provided inspiration, hope and an attractive programmatic platform for the young people; men who themselves were filled with the ideas of the Black Power Movement, schooled by the teachings of Che Guevara, Vladimir Lenin, Malcolm X, Stokely Carmichael, WEB Du Bois, Eldridge Cleaver, among others; influenced by the Liberation Movements that were sweeping across Africa, as well as the overthrow of the Shah of Iran and Samoza in Nicaragua, then in hindsight, it appears that Grenada’s 1979 Revolution was destined to happen. Yet, it occurred at a time of tremendous political, ideological and military tension in the world, one that had been polarized into East and West blocs and with each seeking total hegemony. The Grenada Revolution then, which was seen as a product of growing Soviet influence and an affront to the United States of America, became, without its asking, a victim and it may be said, a pawn of the Cold War. The revolution was forced then, to adopt a mindset, attitude and disposition which undermined its own survivability. It became overly protective of itself. As a result, a harmless, critical comment could be seen as a threat that had to be dealt with, and sometimes too, it found itself acting on the basis of rumours. The revolution developed a siege mentality, almost as if it suffered from some form of schizophrenia. So it started its 400 meters race with its hands tied behind its back as it were, which makes its successes even more laudable. In its four-and-a-half years, while still an infant, the revolution had in its armoury, a long catalogue of widely acknowledged successes. For example, the hundreds of university and tertiary scholarships provided to the children of ordinary Grenadians in well over thirty countries around the world; its free secondary education along with school books and uniforms; The National In-Service Teacher Education Programme (NISTEP); and the Centre for Popular Education (CPE) in which thousands were mobilized in a national effort to eradicate illiteracy. There also were the Revo Milk widely distributed free of cost; Maternity Leave with pay; The over fifty miles of Farm and Feeder roads which were already built; The building of its US$70 million International Airport at Point Salines — a flagship construction project that has since had the effect of massively expanding the tourism sector; The National Transport Service (NTS) which provided cheaper and more efficient transportation around the island; the electrification of Carriacou and Petit Martinique; The Marketing and National Importing Board (MNIB) which allowed ordinary Grenadians to buy basic food items at a much cheaper cost; The National Insurance Scheme (NIS);and unemployment dropped from 49 % to 12 % by mid 1983. Forty-four State Enterprises, including NCB, GBC, Agro Industries and the Fish Processing Plant had, by 1983, put $7 million in net profit into our coffers; the millions of dollars saved by the massive mobilization of its people in volunteering their labour on various projects throughout the island. The list is unending. But despite the revolution’s indisputable and remarkable achievements, its noble ideals and commendable intentions, the revolution’s modus operandi was not always unimpeachable. One may say its successes came at too high a cost, not unlike a pyrrhic victory. The revolution suffered as well from an allergy called criticism. Its intolerance led to the imprisonment of many persons without charge, trial or just cause. While its popular organs of democracy were at work, it did not encourage opposing views; indeed, any attempt at developing independent political organizations was suppressed. There was flexibility in its economic policies but politically it was always hard-ball. With this hard-nosed approach, it may be said, with some justification, that the revolution showed no less obstinacy and intransigence than the Gairy regime. Additionally, there may be many other well-deserved criticisms that can be leveled at the revolution; but, it would be more instructive, in the view of this newspaper, to embrace the revolution’s legacy and the lessons it has left behind. At a governmental level our governments’ policies and approach should always be one of tolerance and inclusiveness. Always seek the resolution of conflicts through peaceful means. The changing of governments through armed revolution, which has inherent and lasting dangers, was a consequence of a particular era that has long past. Create avenues so that the people can effectively participate in decision-making. Rather than responding to ideological and party-political dictates, always put the needs of the country first. Indeed, much of what we say and do, should seek to ‘demilitarize’ the party-divide; it is the only way we can hope for genuine unity. Demonstrate to people that their opinions are valued, their voices heard and are a determinant in decision-making, regardless of political affiliation. Hopelessness breeds contempt and strife. At all cost, people’s constitutional rights and freedoms must be respected. However small the national economic pie, it should be divided fairly among all its people. An independent body with legal teeth should be established to ensure continuity in government. An incoming government, for example, should not feel the need, nor have the power, to slash beneficial programmes and projects, only because they were instituted by the out-going government. Much more can be added to the many lessons to be learnt from the 1979–1983 Grenada Revolution. It achieved successes and made mistakes. Caribupdate Weekly also believes that those who led this process were selfless and dedicated men and women of a caliber yet to be seen since.